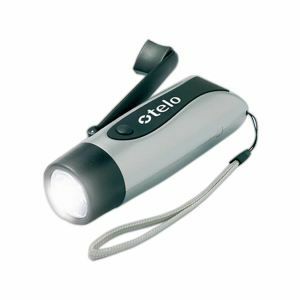 Green Products - LED flashlight and mobile phone charger. LED flashlight and mobile phone charger. Rotate dynamo handle to power the bright 5 LED flashlight and mobile phone charger. No need to consume batteries. A must have for emergencies. Includes gift box with mobile phone connectors, hand lanyard and user manual. Manufactured under stringent RoHS standards for environmental protection. Cranking the dynamo handle for 1 minute generates approximately 45 minute light or 2 minute talk time. Tags: LED flashlight and mobile phone charger.